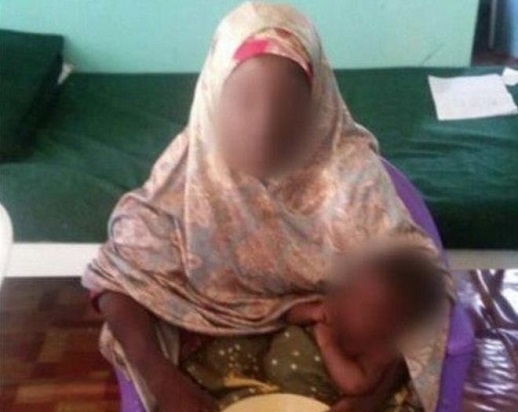 The first missing schoolgirl kidnapped by Boko Haram militants two years ago has been rescued. Amina Ali Nkeki was found on Tuesday (17 May) in the Sambisa Forest, close to the border with Cameroon. Her return has now raised the hope that the rest of the 218 missing girls may yet be rescued. Hosea Abana Tsambido, the chairman of the Chibok community in the capital, Abuja, told the BBC that Amina was found during a routine daily patrol by the Civilian Joint Task Force (JTF), a vigilante group set up to help fight Boko Haram. “She was saying … all the Chibok girls are still there in the Sambisa, except six of them that have already died,” said Tsambido. An uncle, Yakubu Nkeki, told AP that Amina was later reunited with her mother in Chibok. She was 17 when abducted and is now 19, he said. A neighbour in Mbalala told the BBC that Amina was found with a baby. Vigilante leader Aboku Gaji told the BBC: “The moment this girl was discovered by our vigilantes, she was brought to my house. I instantly recognised her, and insisted we should take her to her parents. “When we arrived at the house … I asked the mother to come and identify someone. The moment she saw her, she shouted her name: ‘Amina, Amina!’ She gave her the biggest hug ever, as if they were going to roll on the ground. We had to stabilise them. Amina, along with 275 other schoolgirls, was kidnapped by Boko Haram from her dormitory in Chibok, on 14 April, 2014. Their disappearance eventually generated headlines around the world and fuelled a social-media storm, with the hashtag #bringbackourgirls. Joining the campaign were public figures such as American First Lady Michelle Obama and Nobel Peace Prize winner Malala Yousafzai, the Pakistani schoolgirl who survived a 2012 assassination attempt by the Taliban. A month ago, the radical Islamist group released a video (timed to coincide with the second anniversary of the kidnap), showing some of the kidnapped girls. The 54 minutes of footage, apparently filmed on Christmas Day 2015 and broadcast on CNN – amongst other outlets – shows 15 of the girls pleading with the Nigerian government to co-operate with the militants for their release. The girls said they were being treated well but wanted to be with their families. It was the first potential evidence that the girls may be alive since May 2014, when the leader of the radical Islamic group released a video claiming the kidnapping of the school girls and that he had converted them to Islam. Some 170 among the 218 missing girls are members of the Church of Brethren (known also as EYN-Ekeklesiya Yan’uwa Nigeria). Other women rescued from Boko Haram camps claim to have seen the girls. According to their testimonies, some Chibok girls became Muslim fighters and others were segregated and treated well – for potential use in any bargaining. Parents have found it hard that the Nigerian government has communicated little of the continued search, or what it says have been ongoing negotiations with Boko Haram to secure the girls’ release. The kidnap of the 276 school girls at one time is the largest single group of young women kidnapped in northern Nigeria, but there have been numerous others. A report detailing such treatment of minority Christians since 1999 is part of the evidence being presented to the International Criminal Court in The Hague to examine whether Boko Haram’s abduction of Christian children may constitute genocide, as the “forcible transfer of children”. The vast majority of girls in the school were Christian. “Our Bodies, their Battleground” has been quoted extensively in Human Rights Watch’s submission to Chief Prosecutor Fatou Bensouda.